consciousness with the energy and vibration of the Universe. 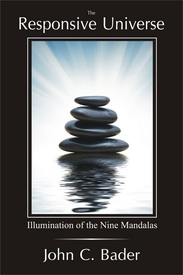 The Responsive Universe – Illumination of the Nine Mandalas by Wisdom Moon Publishing is a new and insightful book about finding happiness in a world of indifference. The idea behind this book was born from my own spiritual self-discovery, years of meticulous scientific research and true life experiences. My own path from rock bottom to eventual happiness and success mirrors a self-evolution which slowly has shifted my energy away from ego and false self to a new sense of reality. In Buddhism this new reality is sometimes called your True Nature. True Nature is our pure-self, void of ego and fear. It is the metaphorical blue skies that sometimes get obscured by the storm clouds of conflict, suffering and daily life challenges. At birth we are born free from social conditioning and the constraints of ego. As we mature and evolve into adults we unintentionally become this person that society has molded. Anxiety, control patterns and dogma drive our actions and reactions; many times unknowingly. Most of our thoughts are rooted in the past and future - fear and fantasy; rarely ever centered in the present moment. The goal of the Responsive Universe is to reawaken to your True Nature and center yourself in the present moment; this amazing and empowering connection to the sublime intricacies of the Universe – An unseen but indestructible bond to a matrix of energy, vibration and wisdom. Each Mandala is a chapter forward to self-discovery with the objective to create small subtle shifts in our daily life that will allow us to grow and evolve into something more pure and authentic. You will be introduced to a collection of helpful meditations, exercises and daily life practices which will allow you to begin your very own journey to self-discovery. The Responsive Universe will discuss topics like ego, religion, self-esteem, the afterlife and karma; all in an effort to make life’s uncertainties and challenges more palatable. As we bridge science with spirituality, this jump in blind faith becomes more of a step forward away from mediocrity and the mundane toils of life. The purpose of the Responsive Universe is not to preach or teach but to remind us that we are connected to something amazing and surreal. We are not just humans but instinctual energy connected to everything. The focus is to rediscover this true reality that sits stifled under the controlled chaos of life. Everything we need for happiness is already found inside of us. The goal of the Responsive Universe is to reacquaint you with your True Nature so you can begin to see the world as a refreshing place full of opportunity and happiness. Through space, clarity and responsiveness, you will emerge as a new person; energetic, fulfilled and happy. Are you ready to disembark on your very own journey to self-actualization? Are you ready to leave the social static of the ego driven world and embrace true illumination, happiness and understanding? Your journey begins now and as you will soon find, positivity and possibility are boundless when you live in a Responsive Universe. We are all connected at the sub atomic level – a tapestry of energy and instinctual consciousness: Our own thoughts, actions and reactions at the forefront of creation within this boundless Responsive Universe. John C. Bader is a wellness advocate and consultant specializing in spiritual self-evolution, meditation and bio-energy healing. A regular contributor to wellness blogs, much of Johns writing focuses on the ambition to bridge science with spirituality as well as steps to encourage more mindfulness in daily life. As a person who is a student and mentor on an evolving path to self-discovery and enlightenment, John contends he is really no different than you. He adds that we all probably have more in common than we know. We both have stories to tell, some good and some bad. We have faced success and loss and many of us are just working our way through this thing called life. Still, the same questions seem to arise: What is the key to happiness and what is our purpose in life? John explains that knowledge comes from life experiences and being mindful of the present; coupled with our faith from knowing that we have in our possession the key to unlocking the door to happiness. The Responsive Universe is that key to happiness; a step by step journey that involves shedding the ego and false-self to connect with something more authentic and empowering. John states that the proof will be in the experience. “The art in life is having faith that the gift of self-discovery exists and then having the mindfulness to accept those gifts when they arise.” John C. Bader is a California native now living in the Chicago area. He enjoys traveling to surf destinations, exploring the night skies as an amateur astronomer, reading books and cooking for friends and family. He states further, “god’s greatest gift to us is our mind and the energy that surrounds it. And here I am – one person whose mind is very capable of sinking into hate and misery. I could choose that path, or I could choose an uphill journey and pen Nine Mandalas to enlightenment in an effort to help others around me. I know I am not alone with my struggles and questions and that is why I wrote this book”. Wisdom Moon Publishing is dedicated to offering creative, original books that foster an inspired appreciation of our life experiences, relationships with others, and the world. The primary interest of Wisdom Moon Publishing is in the works that present a dynamic understanding of the human condition and its particulars, to inspire in readers a vibrant sense of their experience, personal potential, and well being. And in works that enhance our understanding of our interactions with others, and our dealing with the world as it presents itself to us. Wisdom Moon Publishing is partnered with Ingram in an effort to distribute the Responsive Universe across a wide platform of retail sites and locations. All images used with permission of the copyright holders.